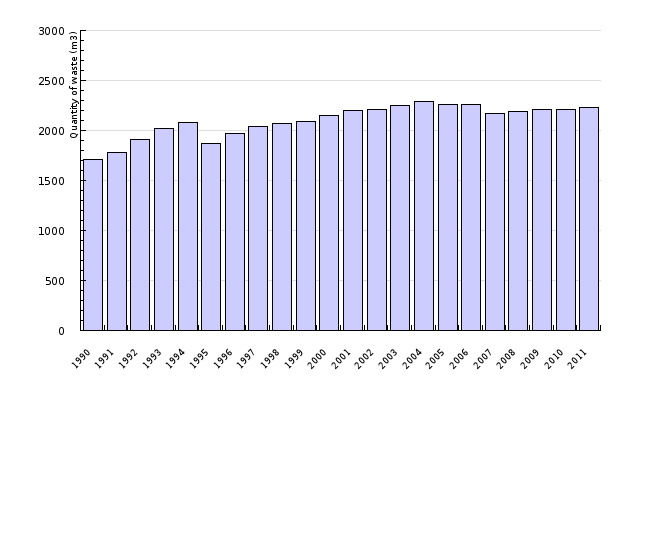 In the 1990-2011 period, the quantity of spent nuclear fuel, which is the only type of high-level waste in Slovenia, increased by 6 % annually. As there is still no satisfactory method of waste storage, the accumulation of this waste poses a reason for concern. At the end of 2009, the location for the low and intermediate level radioactive waste repository in Vrbina pri Krškem was finally confirmed. This indicator monitors the quantity of spent nuclear fuel, which provides a good estimate of the situation in the field of radioactive waste. Furthermore, it contains a projection of the production of electricity from nuclear power, as it is a rough indication of the quantity of spent nuclear fuel in the future. It also monitors the volume of intermediate and low-level waste. The measurement unit for the quantity of spent nuclear fuel is tHM (tonnes of heavy metal). Nuclear electricity generation is calculated in terawatt hours (TWh). Low and intermediate-level waste is stated in the number of drums or other units or in terms of volume (m3). • Low-level waste (LLW) – small to negligible amounts of radioactivity and, as is the case with intermediate-level waste, classified into beta-gamma emitters and alpha emitters (Agency for Radwaste Management, 2007). Slovenian Nuclear Safety Administration, 2012. - to provide permanent solutions for waste management (construction of the low and intermediate level radioactive waste repository, providing a long-term solution for depositing spent nuclear fuel and high-level waste). 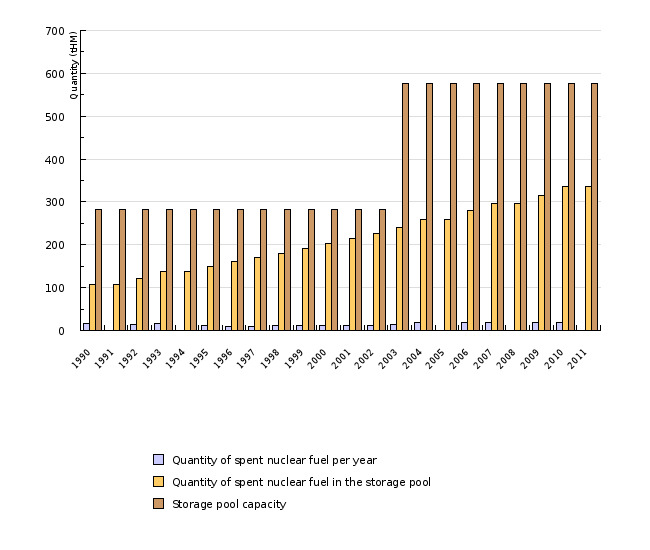 Source database or source: Data on spent nuclear fuel and the quantity of intermediate and low-level waste (Slovenian Nuclear Safety Administration – Annual Report) and Quantity of low and intermediate level waste at the repository of the Krško Nuclear Power Plant (Agency for Radwaste Management – Annual Report). Data administrator: Slovenian Nuclear Safety Administration (Marko Giacomelli) and Agency for Radwaste Management. Methodology and frequency of data collection for the indicator: Data are prepared on an annual basis. Data processing methodology: Average annual growth is calculated using the following formula: [(last year)/(first year)]^(1 / the number of years) – 1] x 100. - Advantages and disadvantages of the indicator: Data on spent nuclear fuel are reported by the Krško Nuclear Power Plant and the Jožef Stefan Institute and are of a high quality. Data on the volume of low and intermediate-level waste are of a lesser quality, as they encompass different shapes of waste. - Agency for Radwaste Management, 2005. Strokovne podlage nacionalnega programa ravnanja z RAO in IJG (Expert Background for the National Programme for Managing Radioactive Waste and Spent Nuclear Fuel). - Agency for Radwaste Management, 2009.Annual Report 2008. - Agency for Radwaste Management, 2011. Annual Report 2009 and 2010. - Ministry of the Economy, 2009. Zelena knjiga za Nacionalni energetski program Slovenije (Green Paper for the National Energy Programme). - Krško Nuclear Power Plant, 2012. Annual Report 2011. - Slovenian Nuclear Safety Administration, 2012. Annual Report 2011 on the Radiation and Nuclear Safety in the Republic of Slovenia.